We live in a world full of advanced and continually advancing technology. This technology continues to speed up the pace of our lives but it also comes with certain risks that need to be understood. This is particularly true in the world of residential and commercial security. It seems that all technology can eventually be hacked but some products are easier than others. Vulnerabilities exist because the developers or manufacturers of a product oversaw these flaws. These are the flaws that malicious hackers take advantage of. Yes, it is true. Security cameras can also be hacked and they actually have been hacked on several occasions. Fortunately, there are reputable companies working on this problem constantly for their own products and others. Also, there are people who monitor the situation itself, providing the industry and the public with available knowledge, such as which equipment or service is vulnerable to begin with. Let’s take a further look. This list was compiled by security professionals and others who have been monitoring this situation. There are some ways to tell if your security cameras have been hacked. One way you would know for sure is if someone has already hacked your camera and started live streaming the footage on the Internet. This was reportedly an incident that has already taken place in the city of Houston in the United States. Hackers are able to easily hack into a security camera and download or stream that video footage from your security cameras at home. Do not use simple passwords or default settings. This is one of the easiest ways a hacker can gain access. If you have found that security or other settings have been changed or if you notice your equipment making noise or doing things that you did not set them up to do, there is a good possibility that your cameras for security have been hacked by someone. Wireless or WiFi based cameras are the easiest to gain access to from the hacker perspective. This is because they have access to the connection point and then all they have to do is figure out a password or find a vulnerability to get in. In these scenarios, there are some things you can do to protect yourself so your cameras are not being hacked. 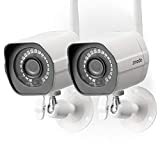 One of the most important ways is to get more advanced security cameras that use good encryption methods, so that it is not so easy for hackers to gain access. Keep the devices that have access to this equipment limited. Only use one computer to access them, for example. Also secure your router. There are a number of other tips as well such as upgrading firmware, installing antivirus software and installing a firewall on your wireless network. Interested in monitored home security? Get a free quote from Protect America.